Russian inflation accelerated in August and remained close to its fastest pace in more than five years as food costs continued to rise. The Russian inflation rate rose to 15 percent from 14.7 percent in July, according to data from the Moscow-based Federal Statistics Service earlier today. Month on month, prices were up 0.4 percent, after rising 0.5 percent in July. 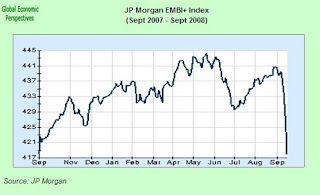 The central bank forecast slowing monthly price growth or a possible decline in August. Monthly inflation increased ``unexpectedly'' on meat and dairy costs, Alexei Ulyukayev, the central bank's first deputy chairman said in response. Food prices increased an annual 22 percent in August, including a 45 percent gain in pasta and a 33 percent rise in dairy costs. Russian stocks fell again this week and the cost of insuring government bonds from default rose to its highest level in four years following central bank intervention to shore up the ruble. Bank Rossii said yesterday that it had intervened in currency markets again, buying rubles using foreign currency reserves, after withdrawals by investors sent Russia's currency to its lowest level in almost a year. 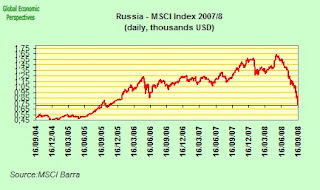 Russia's RTS Index dropped 3.8 percent on Friday, capping its worst week since May 2006, and credit-default swaps on the government's debt rose 14 basis points to 166, the highest since November 2004. The ruble, which is kept within a trading band against a currency basket to limit the impact of fluctuations on the competitiveness of Russian exports, fell to as low as 25.5196 per dollar at one point on Friday, the weakest level since Sept. 11, 2007. The central bank in Moscow responded by selling a ``significant'' amount of foreign currency to prop up the ruble, First Deputy Chairman Alexei Ulyukayev said. ``The ruble had got to the higher end of the trading band, so it was reasonable,'' he told reporters in Sochi, declining to give the exact amount. The bank sold about $4.5 billion of foreign reserves yesterday, according to an estimate by Mikhail Galkin, a fixed-income analyst at MDM Bank in Moscow. 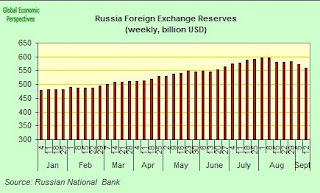 However, with over $500 billion in reserves at this point, it is hard to see Russian reserves coming under any real pressure. The Achilles heal here as far as I can see is the combination of strong domestic inflation and falling oil and commodity prices. The ruble was 0.1 percent lower on the day versus the dollar, closing at 25.4788. Investors have now pulled a net $4.6 billion out of Russia since the invasion of Georgia last month, according to central bank data, contributing to the worst quarterly slump in stocks since the sovereign debt default a decade ago. 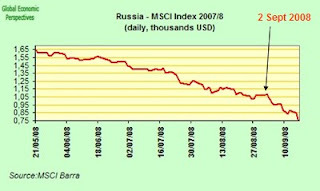 Declining crude oil prices are also adding to Russia's current woes. It would seem that the central bank is buying more rubles at this point than at any time in recent years, quite possibly the most since 1998. The RTS stock index, which has been up an annual average 51 percent since 2001, has now fallen 36 percent since July 1, the worst drop since the government defaulted on $40 billion of debt in August 1998. 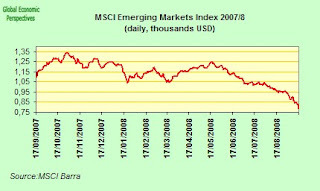 The dollar-denominated RTS index dropped to 1,469.15, bringing its weekly slide to 11 percent. 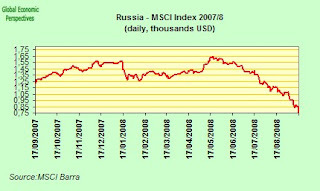 The ruble- denominated Micex Index sank 3.7 percent to 1,234.71, the lowest level since June 2006. The Georgia conflict has only been the most recent in a long line of issues which have been giving investors concern about the future evolution of Russia's financial and economic system. BP and its billionaire Russian partners are currently wrestling for control of TNK-BP, Russia's third-biggest oil producer. Two years ago, Royal Dutch Shell, Europe's second-biggest oil company, ceded control of its biggest operation in Russia - the $22 billion Sakhalin-2 oil and gas project - to OAO Gazprom, Russia's largest company. Five-year credit-default swaps on Gazprom rose 13.5 basis points to 298, the highest level since March, and shares in Gazprom tumbled 3.7 percent to 220.72 rubles by the Moscow close in Moscow, after being down as much as 8.3 percent at one point. OAO GMK Norilsk Nickel, Russia's biggest mining company, slipped as much as 15.2 percent, before closing 9.6 percent down at 3,834.09 rubles. Oil has fallen 8 percent this week, the most in almost two months, with crude for October delivery standing at $105.71 on the New York Mercantile Exchange on Friday. Nickel dropped $580 to $18,625 a metric ton. Russian service industries expanded in August at the slowest pace in seven months as companies received fewer new orders and hired fewer workers, according to the latest survey from VTB Bank Europe. The Purchasing Managers' Index of growth in services dropped back to 55.4 from 58.3 in July. 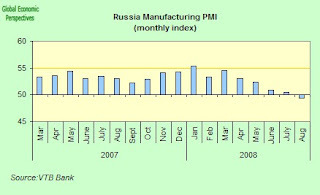 This was the steepest monthly decline since the survey began in 2001, and in conjunction with the manufacturing PMI published earlier in the week gives a clear indication that the Russian economy is slowing. 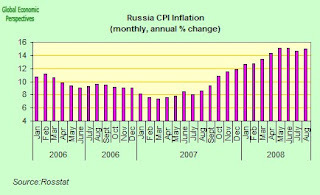 Russian economic growth is expected to slow to around 7.5 percent in 2008 - down from 8.1 percent last year - as the higher cost of credit and slowing wage growth take the momentum out of the country's consumer boom. The number may be lower at the end of the day depending on how rapidly the economy slows. Real wages rose at an annual 11.6 percent rate in July, compared with an 11.7 percent one in June, according to the Russian statistics office. Disposable income advanced an annual 7 percent in real terms in July. Russian manufacturing contracted in August for the first time in almost four years as businesses won fewer new orders and companies cut jobs. VTB Bank Europe's Purchasing Managers' Index fell to 49.4 from 50.4 in July, the fifth consecutive monthly decline and the first contraction since November 2004. 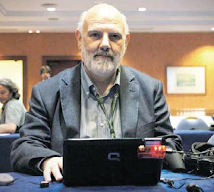 A figure above 50 indicates growth. Dmitri Fedotkin, an economist at VTB Bank Europe Research, said in his statement that the major factor underpinning the weakening in activity had been a decrease in new orders, which fell for the first time in almost 10 years. According to the lastest data from Rostat, industrial output rose by an annual 3.2 percent in July (following a y-o-y of only 0.9% in June), a much slower pace than would be generally expected given that economic growth had been running at around a 7.5% annual rate. 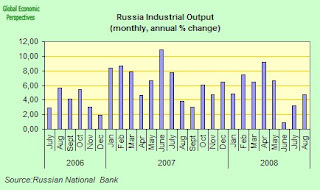 And Russian industry is downsizing on employment. 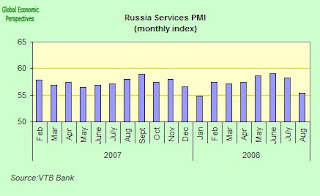 ``With output requirements set to fall in light of the drop in new work received during the month, Russian manufacturers shed staff on average in August,'' according to the VTB report``The current sequence of workforce shrinkage was extended to four months. The economics of this is really very simple. Continuing internal price and wage inflation is making domestic industry uncompetitive. The cost of goods leaving Russian factories and mines was up an annual 33.7 percent in July, the fastest pace in 3 1/2 years, led by fuel and coking coal prices, according to recent Rostat data. Import substitution is taking over, but this process has a cushion as long as oil revenue continues to plug the gap. Oil output dropped slightly this year, but record prices have, naturally, made this a boom year, however, in the longer term, GDP growth rates around the present level and stagnant oil output become incompatible given the growing lack of price competitiveness in major sectors of the Russian economy. 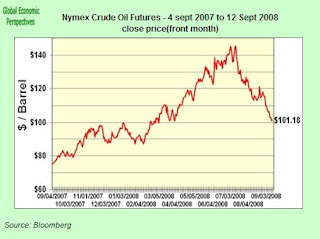 Urals crude is up by a monthly average of around 75% over 2007 so far this year, but this kind of increase cannot be anticipated next year and the year after etc, etc.